Write a note of thanks or encouragement for your next birthday, wedding, or graduation, with any one of the four cute designs featured in this notecard set. All 40 notecards are blank inside and come with a coordinating envelope. Easy to buy in bulk to spread cheer throughout the year! Buy this card assortment with confidence; the Hallmark brand is widely recognized as the very best for greeting cards, gift wrap, and more. Write a note of appreciation, encouragement, or any other special message with one of four cute designs in this notecard set, featuring polka dots, flowers, a celebratory banner, and bold lettering. Boxed set includes 40 cards (10 of each design) and 40 envelopes in coordinating colors. Blank inside, each card has plenty of space to express thanks or write a thoughtful note! Be prepared for any occasion that calls for a card. 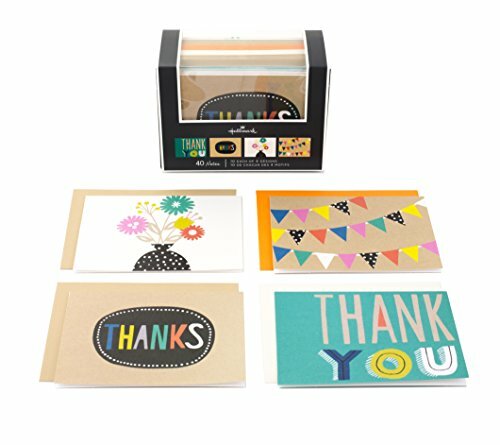 This variety of thank you and blank designs has everything you need to acknowledge the special moments of every day. Notecards measure 5.5 by 4 inches. Box features Velcro closure and is reusable for card organization. Hallmark stationery is made with paper from well-managed forests.